What to Buy 13 Year Old Boys? 13 year old boys are right at the beginning of the awkward teenage years and they can be difficult to buy for. They stil enjoy having fun and spending time with their male friends but they are discovering about being and looking cool and may reject ideas if they don't seem to fit right with them. Despite being difficult it's not impossible to get them something they'd like and this gift guide serves to give you lots of ideas. Now many 13 old boys will feel they are too young for toys. But even men love their toys and they're are plenty of ideas in this category that young teenage boys will enjoy. As a general rule, look for toys and games that adult men would also enjoy and you can't go far wrong. Check out a couple of options below too. Teenage boys will love the peverse nature of this game. Simply hold onto a silver handle and press the start button to start the lights and sounds. When the sound stops and the light goes from RED to GREEN, press the button - fast. The slowest person will get a shock! You can change the intensity of the shock. It's great for parties and groups of friends to play. There are lots more cool toys that are perfect for teen boys. Featuring high-tech target vests, a patented stealth mode, and immersive gameplay, this interactive family game delivers a real arcade experience in your own home. The quadcopter is equipped with one key taking off and landing, which makes the drone easier to fly and better to control for any level of players. Once activated, the pilot is able to fly the drone to any location without the need to worry about which direction the drone is facing. When you release the throttle stick and the mini drone will be locked at a certain height, which makes controlling the drone much easier. Super suitable for beginners, kids and hobby users. 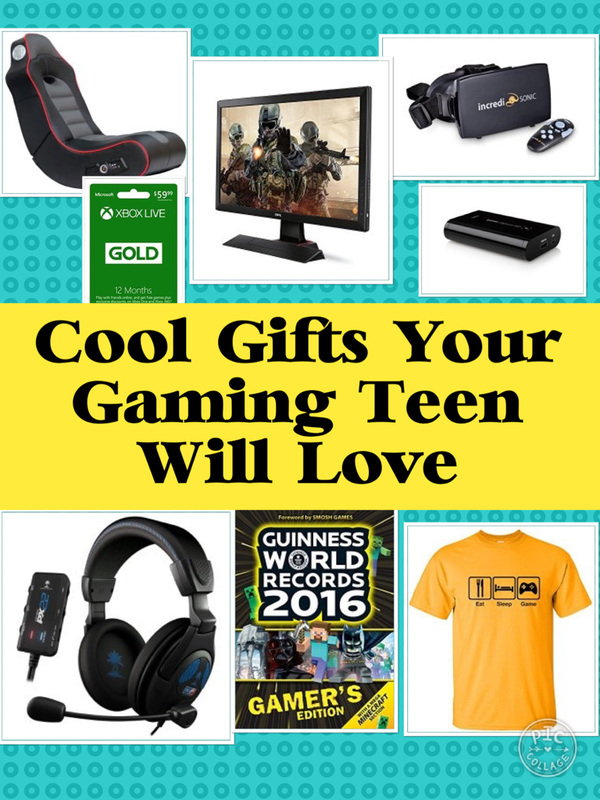 If he already has a console and you're not sure what video game they would like there are lots of cool gaming accessories that make good gifts including gaming headphones or a gaming headset. If they want a video game, ask them what they want before you buy and make sure you know what games console they have so you buy the right games. Another idea is a gift card so they can buy the video game they want. Check out the gaming gift guide for these and lots more ideas. If the teenager you are buying for already have a Nintendo Switch, they will love the Nintendo Labo to play with. Nintendo Labo is a gaming and construction toy platform. You use the cardboard cut outs to construct five different projects which include two Toy-Con RC Cars, a Toy-Con Fishing Rod, a Toy-Con House, a Toy-Con Motorbike, and a Toy-Con Piano. Putting together the toy-con projects is very educational. Kids follow the instructions to make each one. Concentration is required! Then kids can then bring each toy to life with the Nintendo Switch console and Joy-Con controllers. Use the constructions to play video games. Play musical notes with the piano, reel in fish with the fishing rod as part of a game and lots more. There are tons of tech gifts that teen boys will love. best tablet for teens. Other general ideas include a cellphone, laptop or mp3 player if he likes music. One of the hottest tech gadgets to emerge in the last couple of years are the go pro cameras. Check out one option of go pro featured below. An action camera is a fantastic gadget for shooting video. They are generally lightweight and super portable and can be attached to all kinds of gear such as bikes, helmets and skateboards with the right kinds of mounts. They can also be used to shoot action of anything from everyday life, to music concerts, to special occasions and parties. The action camera featured will record your video footage in 4K Ultra HD at 30 frames per second and capture images at 16 megapixels. It comes with waterproof casing so he can use it to shoot footage while he's swimming or doing water sports. Another really fun electronic gift is a virtual reality headset. And for the price of a google cardboard set it's hard to go wrong. You put your phone inside google cardboard and it turns your smartphone into a 3D machine. ​Firstly download the cardboard app to your phone and place it into the front of the device which you then wear. It fits most phone between 4 and 6 inches. You can then experience the immersive, fun, exciting world of VR and enjoy 360 degree panoramic videos and photos. As well as games and movies, ride on a rollercoaster or explore a new city. ​If he loves fortnite and he loves to draw too, this book will help him combine both these passions. ​This book is a great way to get him drawing and having hours of fun without playing video games for hours. It's a great inexpensive birthday party gift. You can give them something fornite related without spending a small fortune. If he plays fortnite, he will love this "Floss Like a Boss" hoodie. It comes in different sizes so you can get the right one to fit him. My son has one and since he has had it, he is always reading something from it. You can create a child's account which can be linked to a parent's account so you can just have his books availalbe on the kindle. Reading ebooks means he can have access to all his reading material whether he is at home or at a friend's house or on vacation. People often think it's a bad idea to give books to teen boys (even teens themselves). However, this is because they really haven't considered the range of books that are out there. There are some great humorous, factual and visual books that make great gifts for teens. Boys love pulling pranks and this book has it all. Discover the homework hoax, the squirting blister and the movie popcorn that grabs you back. Freak out your friends with food pranks: a self-peeling banana and the “misfortune” cookies. There's lots of ideas in this book and it's a cool way to get boys reading too. . The 7 Habits book is a great book to help 13 year olds have a headstart in their teenage years.. . It gives guidance to help with the tough issues and challenging decisions teens face. You can buy subscriptions to all kinds of media services. For example, a netflix subscription may be appreciated. Or what about a magazine subscription to a magazine they may be interested in. Now clothes are often difficult to buy for a teenager so you may have to ask his guidance or avoid. Having said this 13 and 14 year olds boys are growing at such a rate, they are probably in need of new clothes. Hoodies and t-shirts are often easiest to buy. There are also lots of accessories you can buy for boys of this age. As Winter is coming hats, gloves and scarves make great practical gifts. If they're into sport, some nice Nike sports socks are another great stocking filler and practical gift idea. Or what about a novelty dressing gown, onesie or slippers. Zombie slippers make a great gag gift. 13 is a special birthday. He is entering his teenage years and is not longer a little kid. There are lots of mementoes you can give and one idea is a 13th birthday t-shirt. There are several different slogans available for these kind of t-shirts. “Made in 2005”, “Straight Out of 2003” or just one with 13th birthday and teenager on it. The t-shirt featured is made out of 100% cotton. As well as a t-shirt don't forget the balloons, banners and badges with the magic number of 13. If they like a certain sport there are infinite gifts you can get. Get them something which they can use to practice their chosen sport. For example basketball players will love a basktetball hoop, basketball return trainer or an indoor basketball hoop. You can all kinds of sports equipment for their chosen sport. Baseball hats and gloves are another idea. Or why not buy them some kit or a new bag to carry their kit in. 13 and 14 year old boys will probably enjoy some target practice with an airsoft gun. Another cool idea is a day out with their friend's paintballing. You can also get them their own personal airsoft or paintballing gun and related accessories. Another idea is a beginner archery kit. I like the ideas of an archery kit as all you need to do is set up a target in the backyard and you can get started. Check out an option of an archery kit opposite. It's a great beginner archery kit with everything you need to get started. For a teenager who's constantly shooting hoops and loves playing basketball, it's impossible to go wrong with his own basketball hoop. The one featured is adjustable from 7 to 10 feet in 6-inch increments so you can make sure it's the perfect height. The good thing about the adjustable height is that it can be brought lower or higher for siblings. The great thing about having a basketball hoop in the backyard is that friends and siblings can also have a go. It's been described as a mix between skateboarding and snowboarding. It definitely has the cool factor but it's super fun too. Hoverboards or self balancing boards are tons of fun. This one comes has a bluetooth speaker. It features LED lights and is electrical safety certified. You can enjoy speeds of up to 6mph and it has a battery life of 45 to 75 minutes. It takes 2 to 3 hours to fully charge. Now he’s a teenager it’s likely that he’ll want to make use of his own space and want to spend more time in his bedroom. This laundry basketball hamper could potentially save lots of arguments between parents and teens. It makes picking up dirty clothes a fun game rather than a chore. Does he like listening to music? Then there are lots of ideas for you. They include headphones, speakers, a music voucher or an mp3 player. Or perhaps he would appreciate concert tickets to see his favorite band or singer. If he likes playing or making music a new instruments, music lessons or some kind of recording studio experience day will probably be appreciated. The Amazon Echo is set to be one of the hottest tech gifts this Christmas. For a 13 year old boy, it's a cool gadget to have in their room. Firstly it's a great speaker to play music in his room. But he also can use it to make calls, set alarms and timers and ask informational questions. The Echo dot is another fab device to have in a teen bedroom. I does everything the Amazon Echo does except the speaker isn't as powerful and it's a lot less expensive. Teen boys can use it to play music, control smart home devices, make calls, send and receive messages, provide information, read the news, set alarms, read audiobooks from Audible, check their calandar and lot more. There are probably lots of things that he needs that would also make fantastic gifts as well. Some ideas include things he may need for school such as a new cool backpack, a kindle paperwhite so he can read books that he likes or new pencil case or stationary can make great stocking fillers at Christmas time. Another idea is a watch. Many kids use their phones to tell the time but he may not always have it with him (for example, when he’s at school). A watch is a fantastic idea so that he can be given the responsibility to be on time for school, for meetings with friends or events. If he’s into sport there are all kinds of sports watches with stopwatches which can be useful. A watch with an alarm can be useful for getting up on time in the morning as well. If you want to get him something that will definitely be useful and he will be using in many years to come, it's difficult to go wrong by investing in a multitool. A multitool fantastic for using around the house, camping trips, odd jobs, outdoor expeditions and it will be so useful to take to college if he goes in a couple of years. A fantastic useful gadget which can be taken and used pretty much anywhere. An awesome practical gift for a teenager. When everything else fails, you can't go wrong with a gift card. There are some great ways to give gift cards to teens. Other ideas include movie tickets or gift experience certificates.